Students belonging to the Scheduled Castes who have passed PU and degree examinations in first class for the first time in 2018 can apply for the Prize Money. ** He / she should secure I class in I attempt, in S.S.L.C. / P.U.C./ Degree/ P.G./ Professional courses. ** He / she should be the student of a recognized institution. ** There is no income limit for sanction of prize money. The rate of prize money awarded to the students in various courses are as follows. Step-2: Click on the “Online Application (Passed in 2018 only)” link. ** Finally hit the ‘Proceed’ button. Step-2 : Select your course completion year from the drop down list. 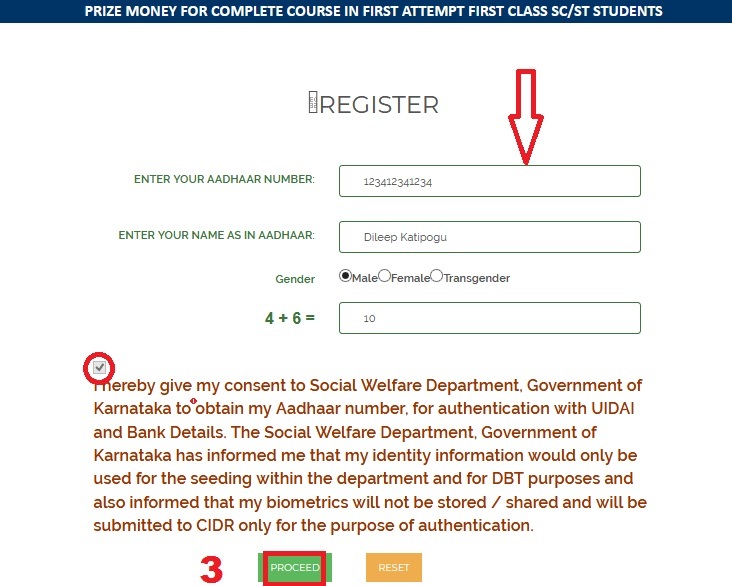 Step-3 : Enter your Registration Number in the space provided. Step-5: Hit the ‘Download’ button. Step-6: Press the ‘Go’ button. Go to the link [https://sw.kar.nic.in/swprizemoney/WebPages/UniversityList.aspx] to view the College/University List. Step-2 : The following page will appear. You have two options. Select anyone of the option [Applicant Number Wise (or) CollegeWise]. ** Select your course completion year from the drop down list. My cousin has got her prize money last month itself. When will I get? It has been 8 months but still it is not showing any bill status. I have applied for prize money before 6 (or) 7 months. Still I am not getting any information about the prize money. Can you give the information about the depositing of prize money? I am studying in 2nd year Diploma. I am not getting this year scholarship. When will I get it? How much prize money will ST students get after 2nd PUC? I have passed PUC in science. I got 59.8%. Can I apply? My prize money scholarship is approved but I didn’t get money in my bank and many of my friends got it before a month. May I know, when will I get my Scholarship? Please give us the information about the prize money. When will we get it? I am studying in 3rd year engineering. When will I be able to apply for the scholarship? Still how many months we have to wait for prize money. It has been 6 months. Still there is no bill status. I want to fill SSLC Prize Money application online. Please help me. It has been 6 months but still it is showing same bill status. When will I get my prize money? I am eligible for prize money but my application got rejected for not submission of documents. What can I do now? My application got approved. When I will get the prize money? My application has got approved, when I will get prize money? Please extend the last date for prize money because I am a B.Sc Medical Lab Technician student. I have still 6 months internship. I had applied in August and my application got approved in September itself. When will the amount be credited? I applied for the prize money and it has been approved on December but still the scholarship amount has not been transferred to my account. Can you please say me, when it will be transferred? I was applied for prize money in Chitradurga district, my application got rejected, but others applications has approved even they have failed in several times in examination, and they were submitted fake marks cards to social welfare office in Chitradurga. After that I went to office and I asked them about my scholarship, they said that I am not eligible. Then I asked about my friends sanctioned scholarship because they are not eligible to get scholarships. But even though they have received. In the welfare office they making politics, Please consider this and look at the originals marks cards and approval the scholarship. I hope you will do the needful. I HAVE PASSED PUC WITH 81.50% AND I BELONG TO SC. I HAVE NOT RECEIVED THE PRIZE MONEY YET. I had applied for scholarship in August. When will the amount be credited to my account? Because the date has been extended. Some one please reply. My application has been approved but, when will they deposit the money to my account? My application is approved at 17.11.2018. When I will get amount in my account? In August month, I applied for prize money but now my application is rejected. I got message like application is invalid. Why? please let me know. My application has been approved and when will the amount be credited to my account, can I know please? My application got rejected, reason is “Not Submission of hard copies of documents”, but I have submitted all documents with in 3 days of online application submission. My application is approved, when I will get my prize money? My application is approved. When will I get the prize amount? In August month, I applied for prize money but now my application is rejected. I got message like application is invalid. Why? Please guide me. Please tell me, Is this scholarship applicable for 2nd year correspondence student also? I have applied for prize money. After few months, I have received a message from DSWO, that documents are not submitted, but I have submitted all the documents excluding final semester original marks card Xerox copy (Because it is still not issued from University), Instead of that, I was submitted the final semester marks card net copy. Is there any problem? My application is approved. When will the amount be deposited into the bank? I am doing PG in Mass Communication in Bangalore University. The result of 2018 is not announced yet. Kindly extend the application date. I have applied before July for prize money. Now date has extended till November. Do I need to apply again? Please reply. I did my M.Sc Agriculture in Assam. Can I apply for prize money (or) not? I have passed SSLC with 86.08 first class. Can I apply for prize money? I have applied for prize money scholarship before 4 months ago. Please let me know, when can I get my scholarship money? I have passed my diploma with 78%. But I have 1 backlog in 2nd semester and then I cleared it in my 3rd semester. Please tell me, am I eligible for prize money? Let us know, Does it require a thumb print? Where should we give it school/college? In how many days, the prize money will come to the account. I have applied for prize money before two and half months, so please give me the information about bill status. My application is approved and bill status shows amount and date 03-10-2018 so when it will get credited in my account? My scholarship is approved but prize money is not deposited in my account yet. What should I do now? I need to the edit the application of prize money. I have filled the prize money application for SSLC students who scored more than 75 percent. When I checked application status, it shows pending. What is that meaning whether is it accepted (or) not? I have completed master degree and I have applied for prize money 2018 and my application was not approved because of some fault in the application. So, please help me. For engineering students, can we apply for all 4 years, (or) is it after completing 4 years? I completed my M.Com course with OGPA 5.98. So, am I eligible to apply for prize money? I have applied for prize money two months back but it is still pending. When will it get approve? I have passed Diploma in 2016-17 but I am not received prize money yet. I have completed M.Sc with 1st class but in 1st semester, I have one backlog but I cleared it at 3rd semester. Am I eligible for prize money? I have got 67.4% in 12th class in CBSE syllabus, Do I get Prize Money? My scholarship has been approved, when will the amount be deposited to my account? My application is approved. When will I get the amount? You will get money in January 2019. I have passed PUC exam in first class so, I applied for scholarship online but the last date is over before I submit the hard copy to the DC office. I need help now. I have completed my B.Sc Agriculture in College of Agriculture, Hassan with 81.15 % in first attempt and I applied for scholarship in the same year in time but my application is not yet approved and my classmates who got below 75% got the prize money. What is happening there? We have not get the result of last semester yet so, kindly extend the last date of scholarship application. I have completed post graduation and waiting for result. I don’t know, when the result will come. I am not able to apply for the prize money. So, please extend the last date of scholarship application. Please extend the last date for Prize Money application. I have completed M.Com in Davangere university. My 4th semester result was announced in 30-8-2018, at 5’o clock. So, I was not able to apply for Prize Money scholarship because that day was last date to apply for Prize Money scholarship. I request you, kindly extend the last date. I have completed BCA but the 6th Semester result is pending. So please help me for applying prize money as last date is 30th September. I just completed MBA degree with first attempt first class and distinction. Now only I got the result but the last date is expired for Prize Money application. What to do now? Is there any chance for extending the last date? I am doing M.A.in Gulbarga University. Last date for prize money is 30-8-2018 but Gulbarga university is not announced M.A 4th semester results yet. I request you, kindly extend the last date. I completed my degree with first class in 2017. Can I apply for it on 2018? I have completed my masters but I am still waiting for 4th semester results. So what can I do? Please guide me, how to apply for prize money. My aggregate percentage is 63 but got 2nd class. Am I eligible for prize money? I am studying B.Ed, can I apply for this scholarship? I need the complete information of SC scholarship for Engineering 1st year students. I have completed MSW recently, final semester results are issued in online but I have not got the final mark card yet then how can I apply because the application last date is 30th August. I did M.Com and awaiting for my 4th semester exam result, I passed and scored more than 70% in each semester, can I apply for prize money? I have done B.A. and applied for prize money but not received the sixth semester mark card yet. The last date is 30-8-2018. What can I do? Please help me. I have passed out my 2nd PU with first class. I want to apply for this prize money. Please assist me, how do I fill my bank details? I have completed degree in Commerce, can I apply for prize money? I have passed PUC in first class and belonging to SC. I have completed PUC in Ganapathi PU College, Mangalore. Am I eligible for prize money? I need the details of SC scholarship of primary school. NOW I AM IN 3RD YEAR, CAN I APPLY FOR PRIZE MONEY? From where should we submit online acknowledgment and other documents after attestation. Please clearly the location. I have completed degree with first class, can I apply for first attempt scholarship? I have cleared B.Com in first class and I had backlog in 2nd semester but I have cleared it, so am I eligible for prize money scholarship? No, it is only for first attempt persons not for repeaters. I have completed my BE in 2018. I had backlogs in 1st and 2nd year but I cleared it. In final year, my total aggregate is 8.14. So, can I apply for this scholarship? Let us know, are SSLC students eligible to get prize money? I need to know, which registration number is required for applying? I have applied for prize money but I am not getting it. Please help me to get it. I want to know, are both Swamaja Kalyana Illake & Valmiki Nayakara Sangha same. I have applied for prize and the application status is approved and bill number also came at 25-5-18 but I still not got the money, please tell me why? I am belonging to ST category and I have got 7.46 CGPA in my 1st year Engineering. Am I eligible for getting this prize money? You can apply once and it depends on overall CGPA secured in final percentage. I am in 2nd BE, I have applied for prize money. When will I get it? I have passed 10th. Can I apply for this prize money scholarship? If one had back log at first semester and now cleared with distinction then can he/she apply for scholarship? I completed my Engineering in 2018. In 2nd and 3rd semester, I got second class but rest of my semester, I got first class so, can I apply for prize money? Myself diploma from lateral entry. I have applied for prize money, now status shows “Principal/ HOD not approval” What does it mean? I have passed my PU in first class and I belong to SC. Will I be get a cash prize? I am reading SSLC. Am I eligible for this scholarship? Sorry, you are not eligible to apply. First you have to complete that. From where should we submit the acknowledgement after submitting the application successfully. We have applied for this scholarship. I want to know, when we will receive the money? I am studying BE and I completed my 1st year with 1st class in 2018 and I belong to SC category. So, can I apply for prize money scholarship. I am studying 2nd year. Can I apply for prize money? I have passed B.Sc degree with 1st class in 2018. I am belonging to schedule caste, I didn’t get the marks card of last semester but I have the photocopy. I also applied for this prize money but I am not submitted documents to social welfare. Please tell me the last date for submission. ಸರ್ ನಾನು BA 62% ಮಾಡಿರುವೇ ಆದರೆ 2nd & 4th semester ನಲ್ಲಿ ಎರಡು ವಿಷಯ back ಆಗಿತ್ತು 6th semester ನಲ್ಲಿ ಎರಡು ವಿಷಯ ಪಾಸ್ ಆಗಿ 62% ಆಗಿದೆ ನಾನು ಅಜಿ೯ ಹಾಕಬಹುದೆ. I have passed SSLC with 73.68% & belonging to SC, Can I get prize money? Please mention, what are documents to be submitted after registration? I have passed SSLC in 2018 with 90%, I belong to SC Category. I need a prize money to pay the college fee. ನಮ್ಮಗೆ MSW ಕಾಲೇಜಿನ ಶುಲ್ಕ ಪಟ್ಟಿಯ ವಿವರ ನೀಡಿ ನಿಮ್ಮ ಇಲಾಖೆಯ ಅಧಿಕಾರಿಯನ್ನು ಕೇಳಿದ್ರೆ ಅವರು ನಮ್ಮಗೆ ಪರಿಪೂಣ೯ ಮಾಹಿತಿ ನೀಡಿ ಸರ್ ..ಮತ್ತು ಈ ವಷ೯ದ ವಸತಿ ನಿಲಯದ ಉಟದ ಪಟ್ಟಿಯನ್ನು ನೀಡಿ ಮಲ್ಲಿಕಾಜು೯ನ್ ಹಟ್ಟಿ ಚಿನ್ನದ ಗಣಿ. I have scored 541 marks in PUC examination 2018. Am I eligible for this scholarship? I have one backlog in 4th semester, I cleared that one, I have aggregate of 60% overall in 2018. Am I eligible for prize money, please let know soon. I have passed degree with first class and I belong to ST, will be I get prize money? One month ago, I got my result but I have not got my original marks cards. What should I do now? I have completed my M.Com last month in Bangalore University through correspondence. Am I eligible for this scholarship? I am a SC student and doing my 2nd PUC. I have applied for scholarship, I want to know, when you people are going to transfer the scholarship money to my account. I had i backlog but I cleared that before going to final year. I finished my degree in 2018 with 70%, Can I apply for it? 25/04/2018 ರಂದು ನನ್ನ ಬಿಲ್ ಹೇಳಿಕೆ ಸರ್, ಇಲ್ಲಿಯವರೆಗೆ, ನನ್ನ ಖಾತೆಗೆ ಸಾಕಷ್ಟು ಹಣ ದೊರೆತಿಲ್ಲ. ನಾನು ಈ ಪುರಸ್ಕಾರ ಹಣವನ್ನು ಪಿಯುಸಿ, ನನಗೆ ಇನ್ನೂ ಬಹಳಷ್ಟು ಹಣ ಬೇಕು. ದಯವಿಟ್ಟು ಅದರ ಬಗ್ಗೆ ಮಾಹಿತಿಯನ್ನು ಒದಗಿಸಿ. I have completed my degree with 1st class. Am I eligible for Prize money? 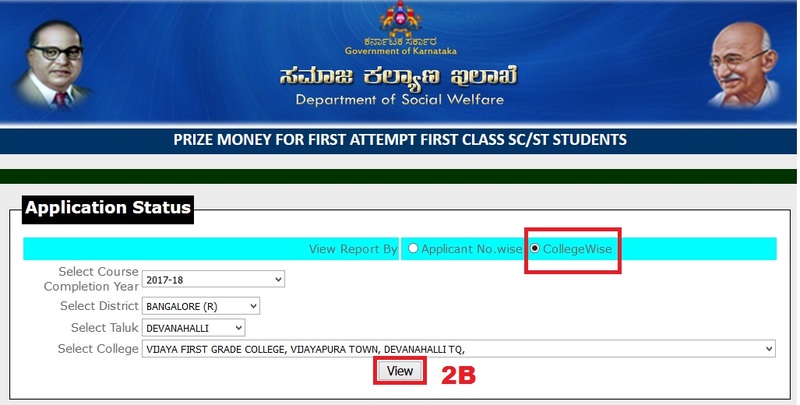 Let us know, why 2012 batch SSLC completed students are not able to fill this application? If I have failed in any of the semester, can I get scholarship? I have same problem, please give me solution. I HAVE PASSED SSLC WITH 86.24% AND I BELONG TO SC. WILL I BE GET CASH PRIZE? I am doing SSLC. Can I get this scholarship? I am doing my 1st year degree course. Am I eligible for prize money? I have completed my BE with 8.13 (73.8%). Can I apply for prize money scholarship? I HAVE PASSED 10TH WITH 86%. IS THERE ANY SCHOLARSHIP SUITABLE FOR ME? I have passed SSLC with 87% and I belong to SC. Will I be get a cash prize? Please update the scholarship of class 10th for SC/ST students. I need to edit my submitted application which has some mistakes. Is it possible? Kindly someone help me in this matter. The website shows always server is busy. Please take immediate action. It is very urgent. I got 125 out of 125 in Sanskrit in 10th std 2018. I am a Arya Vyshya student. Is there any scholarship for me? My family’s annual income is Rs.11000. Please tell me, Are there any scholarships for SSLC students. The application form of ST category prize money scholarship is not responding. Please help me to apply for the same. I am a SC category student I have got 96.16% in SSLC. Can I apply for this scholarship? Let me know, what are the documents needed for application. I have completed my B.Sc Horticulture in 2016 with 76.3%. I have applied for this scholarship and I have not get it but in other colleges, they have got it. So, I have asked them many times no one replied. Ts there any chance of getting now? I am a 2nd PUC student from National Center For Excellence Pre University. As I had passed in my first class, I wanted this SC scholarship for my further studies. I tried to apply, but my collage name is not found on the web site. What should I do now? I am belonging to SC category, and passed 2nd PUC with first class in first attempt from Sri Chaithanya PU College. Can I apply for the prize money scholarship? If you have completed in 2018, then you can apply. I want to know, is this scholarship applicable for class 12th passed students? I have passed SSLC with 1st class. Can I apply for prize money? I have got 88% in SSLC examination conducted in 2018. Do I get any prize amount on my percentage? I belong to SC. I have passed in 2016. Can I apply for this year? Is it make any problem? Please tell me. I passed 2nd PU in 1st class. Am I eligible fir this prize money? Please add the ST.Charles Women PU College, Lingarajpuram, Bangalore in the list because it is missing. I am doing 2nd year degree but I did not get my marks card of 1 year but I have the photocopy of the marks. I am doing BE 2nd year. Could you please clarify, whether I am eligible to apply for the prize money. I want to know that, can SC/ST students apply for this scholarship? Please tell me, Is this scholarship applicable for correspondence students also. I have passed SSLC with 89% and I belong to SC. Will I be get cash prize?